HOLLYWOOD (CBSMiami) – Jean Jacques Fero is washing dishes at the Circ Hotel in Hollywood and couldn’t be happier. He’s employed after some very scary months for him, his wife Ghislene and their 5 children. They arrived from Haiti two months ago and were living in a hotel with relatives, until suddenly everyone was kicked out right before Christmas. “All he could think is where is he going to go with his family,” Jacques said through an interpreter. 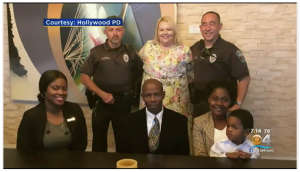 As fate would have it, Jean ran into two Hollywood police officers while walking his kids to school, that meeting with Officers Anthony Truntz and Dwayne Chung changed their lives.